In spite of its humble location and looks, Shinagawa Station played a title role in the development of Japan’s railway system. The country’s very first daily train services, which started on June 12, 1872 (Meiji 5), ran between this station and Yokohama. Yokohama’s foreign settlement had turned into a crucial trading port and was located some twenty kilometers southwest of Shinagawa. 1879 (Meiji 12) Map of Tokyo Bay near Shinagawa: 1. Shinagawa Shuku; 2. Shinagawa Station; 3. Odaiba Forts. 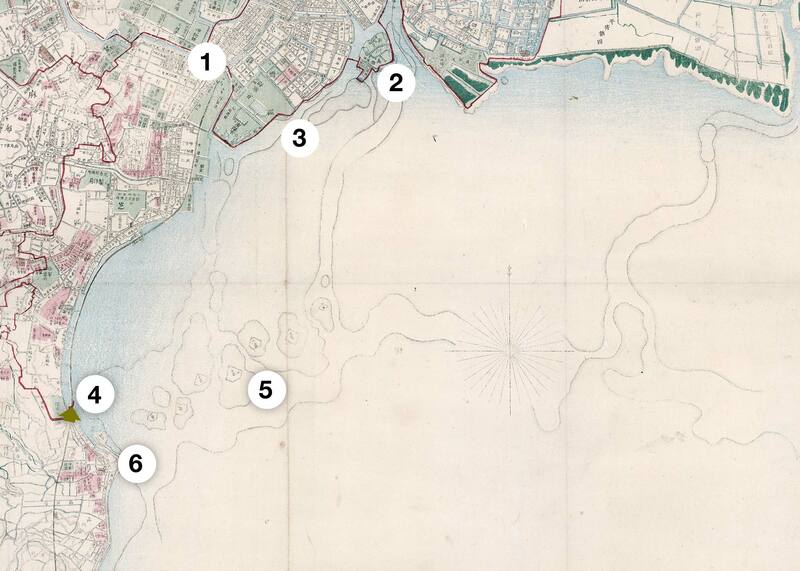 Almost all of Tokyo Bay visible in this map was reclaimed in the twentieth century. That trains went no further than Shinagawa was rather inconvenient for travelers because, as this photo makes clear, it was far on the edge of Tokyo. In those days, Shinagawa was not even part of Tokyo. Nobody would have considered it either. This was countryside. So much so, that on many old maps of Tokyo, Shinagawa lies outside the confines of the map. The railway was really supposed to go on to Shinbashi (also: Shimbashi) Station, near Ginza. But Japan’s military balked. They would not allow tracks on their land. It took months before the line was finally extended to the brand new Shinbashi Station. On October 14, 1872 the line was officially opened by Emperor Meiji and for many years passengers came to see Shinagawa Station as merely an irrelevant stop on their way to other destinations. So irrelevant actually, that in tourist guidebooks to Japan of the late 19th and early 20th century usually just a few sentences are expended on Shinagawa. 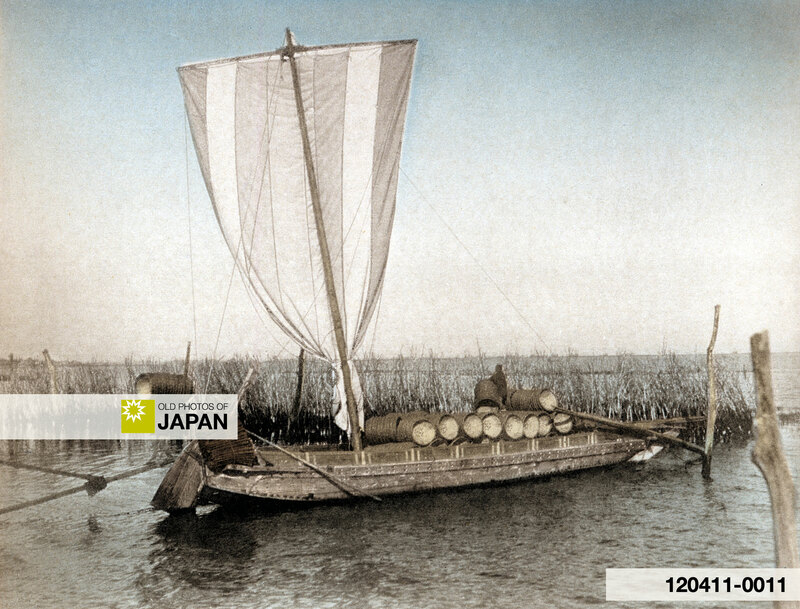 Boat for collecting seaweed at Shinagawa, ca 1895 (Meiji 28). Although guidebooks paid Shinagawa scant attention, it is not surprising that the planners of Japan’s early railways decided to place a station on this spot. For centuries, Shinagawa had been the most important entry and exit point of Tokyo, then still known as Edo. The post station (shuku) here was the first one for travellers starting upon the famed Tokaido highway after they left the zero point at Nihonbashi, in the center of Edo. 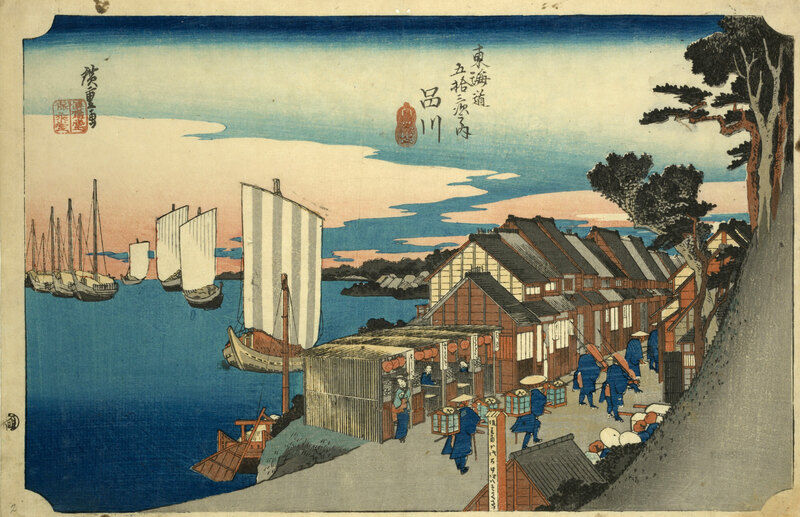 For those traveling the Tokaido towards Edo, it was the last station they encountered before entering the city. There were four other highways connecting Edo with the rest of the country, but the Tokaido was the busiest. Shinagawa bustled with activity day and night. In addition to these officials, there were countless regular travelers, as well as the Japanese feudal lords, or daimyo, who regularly passed through with their large retinues. Some years after the establishment of the Tokugawa Shogunate in 1600, the so called Sankin-kotai (参勤交代, alternate attendance) policy was established. It required that daimyo move periodically between Edo and their fief, usually accompanied by a hundred and fifty to three hundred retainers. These processions were an almost daily occurrence in Edo. Thanks to the huge numbers of people passing through, Shinagawa boasted large numbers of tea houses, inns and brothels. By 1843 (Tenpo 14), there were no less than 93 accommodations with female prostitutes.4 Shinagawa offered essentially the same services and pleasures as the larger entertainment area in Tokyo’s legendary Yoshiwara red-light district. Although exposed to travellers daily, the inhabitants of Shinagawa were a conservative bunch. They had little to no interest in all the changes that were rapidly washing over Japan in the late 19th century. There actually was strong opposition to the railroad passing by so close. As it turned out, the railway took a turn inland close to the station and avoided the coastal town completely. During the twentieth century much of Tokyo Bay was reclaimed. Few people these days even know that Shinagawa Station used to be right on the shore of the bay, with one of the most beautiful views in the Tokyo area. The covered footbridge visible in this photo was most likely built sometime around 1882 (Meiji 15), dating this photo to after that date.5 This photograph, one of the clearest photos of Shinagawa Station in its early days, is exceptionally rare. I am extremely lucky to have it in my private collection. 1 East Japan Railway Company. Transportation // Tokyo Metropolitan Area Network, Intercity Network, and Shinkansen (pdf), Annual Report 2017, 50. Retrieved on 2018-9-24. 2 Farsari, A. (1890). Keeling’s Guide to Japan. Yokohama, Tokio, Hakone, Fujiyama, Kamakura, Yokoska, Kanozan, Narita, Nikko, Kioto, Osaka, Kobe, &c. &c. Kelly & Walsh, Limited: 53. 3 Shinagawa Historical Museum (品川区立品川歴史館). Shinagawa-shuku (pdf), Shinagawa Historical Museum Commentary Sheet. Retrieved on 2018-9-24. 5 Ayako Miura, Shigeru Onoda (June 2009). 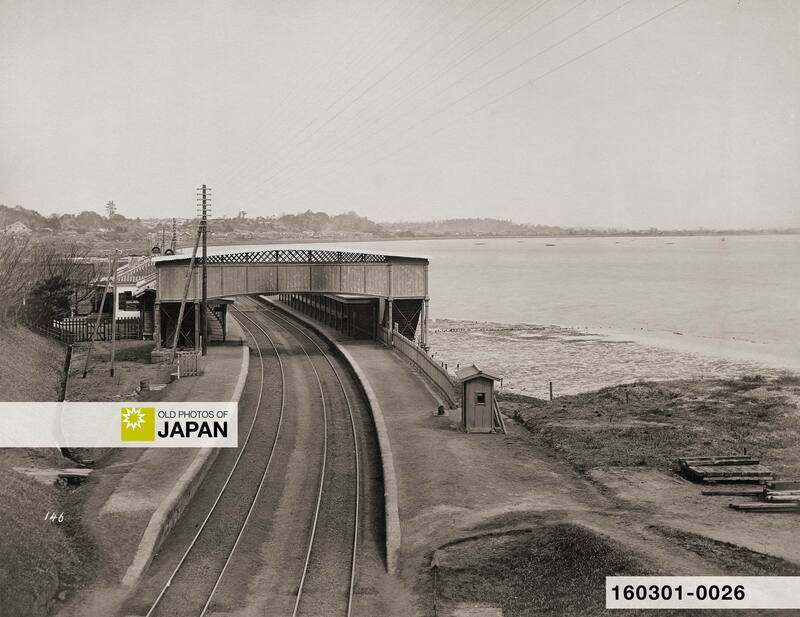 Historical Study on Railway Foot Bridge in the Meiji Era (pdf), AIJ J. Technol. Des. Vol. 15, No.30, 577-580. You can also licence this image online: 160301-0026 @ MeijiShowa.com.